It’s time for the solution to November’s Puzzler. Thanks, all of you for your entries. Those of you who answered “Stephen A. Douglas” are correct. A U.S. Representative from Illinois, then a U.S. Senator, Douglas (April 23, 1813 – June 3, 1861) is buried in this tomb. This was also the location of his estate and one of many large tracts of land he owned. The estate later became Camp Douglas, a training post for Union soldiers. Eventually, the Army used it as a prisoner of war camp for Confederate soldiers, many of whom are buried in Oak Woods cemetery. Douglas was the Democratic Party nominee for President in 1860 and lost to Abraham Lincoln. 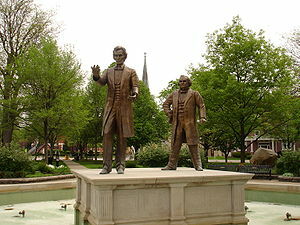 He had defeated Lincoln for the Senate seat two years earlier, the occasion of the famous Lincoln-Douglas debates of 1858. Douglas was known as the “Little Giant” because of his height, 5’4″ and his forceful presence as a politician. One little-known fact: Douglas had briefly courted Mary Todd, who later wed Lincoln. This entry was posted on Friday, November 23rd, 2012 at 5:50 pm	and tagged with Camp Douglas Illinois, Civil War, Lincoln Douglas Debates, Mary Todd Lincoln, South Side Chicago, Stephen A. Douglas and posted in Chicago History. You can follow any responses to this entry through the RSS 2.0 feed.